Pieter Breughel the Elder, inspired me with his painting “The Wheat Harvest”…probably because we had an exceptional wet winter and the summer hillsides as they dried into summer had a beautiful golden color, which I saw, Breughel the Elder had in this painting. After some research I found out Breughel was the first painter to paint regular people working and playing instead of the usual stogy religious or wealthy persons… Breughel may have changed and van guarded how artists painted and selected their subject matter. 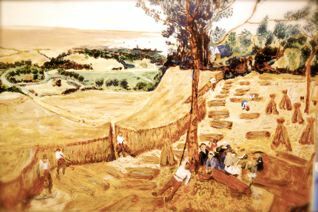 Breughel’s Wheat Harvest really inspired me to emulate his painting best I could. I used an 18×24 canvas which was already prepared and primed in white flake, (which is very toxic for those who work with it, when wet, though I only painted on top of it dry) I have never used paint with white flake. I must say it was an interesting surface to work on, very smooth and white flake really accepted the brush strokes with pleasure. Had his 122 birthday last year in Chicago, evidently some people actually celibated it. Only in Chicago, about 60 people gathered at a Restaurant to party hardy for Hitler’s “birthday”. It seemed they where also celebrating the start of the Civil war…now I do not know if party goers happen to know this, but Hitler was not in the Civil war? According to observations from passer by’s…the room was decorated with swastikas, and banners and there were two cakes which were decorated with the words “Happy 122ed Birthday Adolf” and the other one said…”The South Was Right. White Men Fight.” apparently some people do not have a clue of how many years it has been since the Civil War…which explains some things! Party goers did not wear costumes depicting either Nazis or the Civil war, but there seemed to have been a large number of people wearing tea bags and one person was reported to be riding a strawman,..waving a red fish… which seemd to be a troubling cause of concern among many of the party goers, because they suggested it sort of looked gay? Police Chief Harry Toad, told reporters that a man with a backpack entered the banquet hall and ordered a shot of Tequila and a vegan sandwich with roast beef and cranberry sauce,.. before heading into the men’s room to set off a smoke bomb. Harry Toad said the officers do not have a clear description of the man who threw the smoke bomb, except that he was medium height, with a ruddy complexion, had a peg leg, a patch over one eye and a hook for one hand. Police are asking for any information leading to the wherabouts of this man! Owner of the restaurant, Dusty Bucket,.. said he was not aware that the banquet space was rented for Hitler and he had not noticed the Swastikas! Oppressors do not feel as they should while the oppressed feel as they do . The wicked bathe in glee, as their victims suffer. Apathy spawns, do unto others as you want, but do not do unto me as you want. Emptiness is the treasure for trying to steal happiness. Selfish are blind to beauty. Vindictiveness grows like the cancer it is, while life should grow with love. Pettiness is the substance of nothingness, many abide abundant nothingness. Growing up recent events reminded me of the Georgie Porgie Poem, not sure what the orginal Georgie Porgie was all about, but my rendition seems to be up to date. The real roof over many peoples heads has fallen in, while a metaphorical roof seems to be falling in over most of our heads, as we watch the full of themselves solipsist’s constantly preform their political Kabuki drama of opportunism and one-upmanship shift shaping differences and the similarities of a disappearing the ever less different left playing catch up, merging with the right always attempting to out manipulate the other, with the right power grabbing here and the left grabbing less there, an allusive never ending dance of alleged difference. As a skeptical believer of yin and yang, (scepticism which I am aware is ironic) the ever presence of two opposites seems to be before my eyes in my daily life, right and wrong, hot and cold conservative and liberal, ham and eggs, girls and boys…. well strike the last one. In the world of yin and yang, there is always the opposites, covering everything, though it must be in my nature for some unknown reason to continue my never ending quest to discredit Yin and Yang? So for now, Yin and Yang can cover anything from art to politicks, religion to facts the ever presence of opposites, the opposing two, for instance in the arts of painting there is Yin and Yang of light and dark, the red and blue and then we have the Yin and Yang of politicks, the Republicans and the Democrats, good and bad, the conservative and the liberal. I find the Yin and Yang of politics so much more confusing compared to most things like astro science and the Pope. In politics it takes a tremendous amount of sifting to see, through the endless overwhelming fuzzy Kabuki Theatrics, which makes me wonder at things like Fox News for then, apparently no Yin and Yang their? In my case I am always questioning, separating those well choreographed hidden constant manipulations, never ending going ons, supposedly behind some dark curtain, shadowy figures fighting over who will end up pulling the strings, while the common folk gathers tidbits from trickle down mealy pablum. So it seems to me, the common human may be doomed to a simple Ying and Yang of life and death But the idea of life and death has been changed, for it seems to have been bastardized by Republicans to mean; The Yin of a twinkle in the eye and Yang to mean to birth, for it appears in the powerful world of hypocrisy, after birth the living do not matter. To be used… yes, sending children into a world to starve on the street or die in someone’s made up war, usually a chicken hawks game of war. Where is the Ying and Yang in that? To bring one into the world then outwardly despise them? The aristocracy and the serfs? To be born poor or become part of the middle class, to learn unions are dogs to be put down and the huddled masses are to be manipulated like puppets depending on the whims of the few, supported by cronies. The so full of themselves few, as the monied, the entitled, the new nobles who just happen to be filthy rich and have the money to make more money, you know after all it takes hard work to obtain and buy power, This is the Yin and Yang of the haves and the have nots, the rich and the not so rich, the filthy rich and the filthy masses, some have the Yin of a roof over their head and others have the yang of of a bridge over theirs… yes, I think I got it.